The Alamo Drafhouse Cinema locations in Houston are holding a Home Brew Competition. Click on the image to the left to get the official rules and entry information. 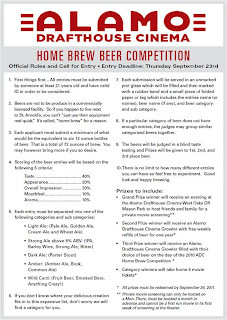 The deadline to submit your homebrew is Thursday, September 23rd. Thanks to The Ferm for noticing this and posting it on Twitter.